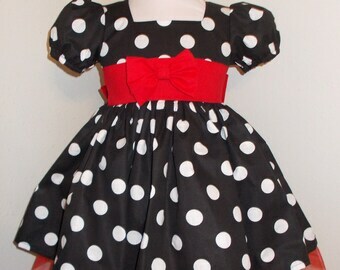 This little dress is made of 65/35 poly/cotton blend white with big red polka dot fabric. 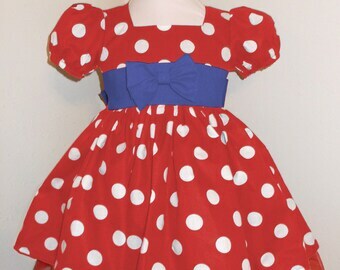 Perfect for a Infant, Baby, Toddler or Girls Shirley Temple Costume. 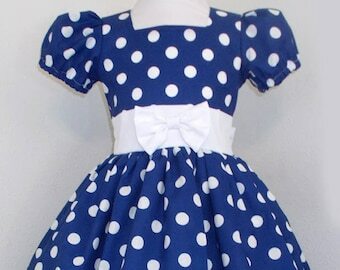 Hand gathered skirt is made extra full for little girl's twirling fun. 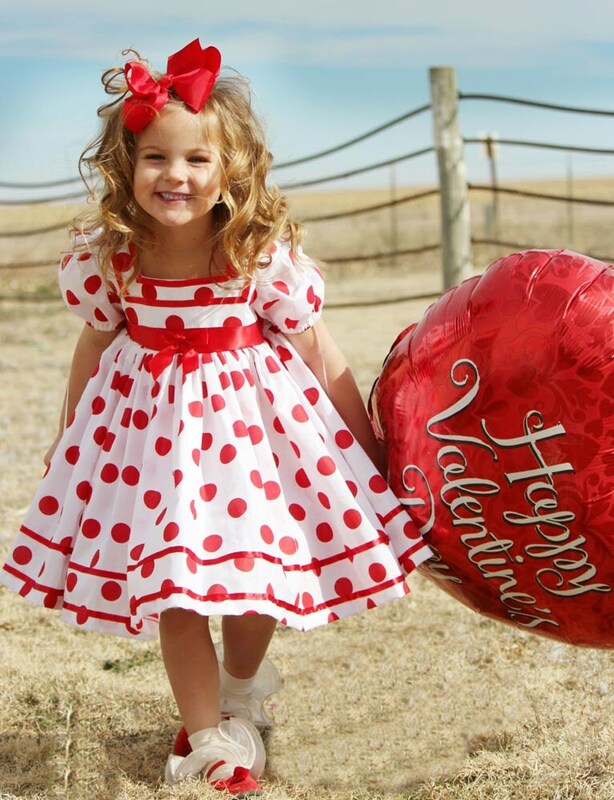 Red Ribbon adorns the neckline, empire waist, and bottom hem so the dress perfectly resembles Shirley Temple's Classic Polka Dot Dress. 3-6 Month - Chest 19" - Waist 19" - Length (shoulder to hem) 14"
6-12 Month - Chest 19.5" - Waist 19.5" - Length (shoulder to hem) 15"
12-18 Month - Chest 20" - Waist 20" - Length (shoulder to hem) 16"
18-24 Month - Chest 21" - Waist 21" - Length (shoulder to hem) 18"
2T - Chest 22" - Waist 22" - Length (shoulder to hem) 19"
3T- Chest 23" - Waist 23" - Length (shoulder to hem) 20"
4T - Chest 23.5" - Waist 23.5" - Length (shoulder to hem) 22"
5 - Chest 24" - Waist 24" - Length (shoulder to hem) 23"
6 - Chest 25" - Waist 25" - Length (shoulder to hem) 24"
7 - Chest 26" - Waist 26" - Length (shoulder to hem) 25"
8 - Chest 27" - Waist 27" - Length (shoulder to hem) 27"
10 - Chest 27.5" - Waist 27.5" - Length (shoulder to hem) 28"
12 - Chest 28" - Waist 27" - Length (shoulder to hem) 29"
14 - Chest 29" - Waist 29" - Length (shoulder to hem) 30"
16 - Chest 30" - Waist 30" - Length (shoulder to hem) 31"
My Abby is still growing and it will be a while before the dress fits well, but...it is precious! Arrived on time, looks just like the picture. Looks Professionlly made.